Three hundred nineteen. That’s how many college football games Steve Spurrier has coached in his football career. One hundred thirty-five of those he coached at the University of South Carolina. Much to the dismay of Gamecock fans everywhere, that number is final. 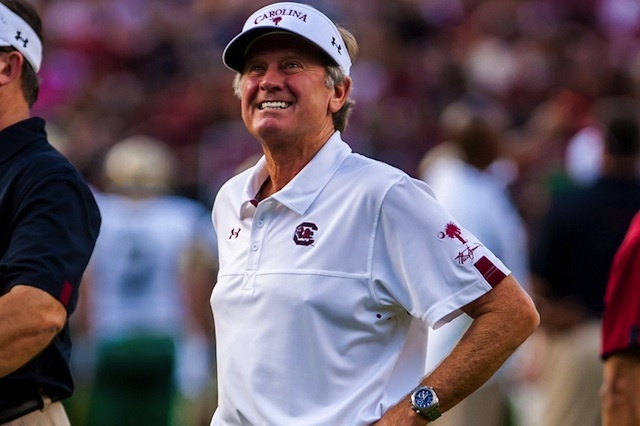 On Monday, Oct. 14, Coach Spurrier, often lovingly called the Head Ball Coach (HBC), announced his immediate resignation after 11 years as the head football coach at USC. During his very last press conference in Williams Brice Stadium, a calm and lighthearted Steve Spurrier, quite unlike the fiery, sometimes “too” honest, HBC that Gamecock fans are used to seeing, told the media and Carolina fans watching everywhere that his time as head coach had come to a close. “I think I was probably the best coach for this job 11 years ago, but I’m not today,” said Spurrier. As South Carolina students watched the press conference all over campus, I stood in the new Journalism school with fellow students, watching in awe as the man that brought so much hope to our university slowly broke our hearts with his resignation. He led us to win 11 games three seasons in a row and beat our rival school, Clemson University, five years in a row. Now he is giving up the headset and visor that he so often flung to the ground after a bad call or bad play. Many wonder why. Why now? Why not at the end of last season? Why not at the end of this season? Why not during an off week for the Gamecocks? Although we may never get the answer to these pressing questions, one thing is certain, the success that Coach Spurrier brought to USC, and college football as a whole, will never be forgotten. We will miss you, Coach Spurrier. Words cannot describe how much you have meant to the University of South Carolina and the beautiful city of Columbia. Your charismatic and energetic personality will be greatly missed, but we wish you nothing short of the best.